At Canonbury Antiques we carry a large range of porcelain and china – Sevres, Meissen, Dresden, Majolica, Asian Pottery, Werbiliki and a whole lot more..
Much of our porcelain is on display in the our Hertfordshire antiques showroom. The Canonbury Antiques showroom is situated in leafy Hertfordshire just outside Potters Bar – right where the A1 meets the M25 in the gorgeous English countryside. It’s a large warehouse open to the public full of goodies from art deco to English dining furniture. Most people’s comment on how much like an Aladdin’s Cave it is as it’s packed the rafters with goodies. Hertfordshire itself is a lovely place to visit – St Alban’s is just five minutes down the road, a lovely market town with Roman ruins and a gorgeous Cathedral, as well as good shopping. The surrounding country side is beautiful so it’s well worth making a day trip around it to visit some of the beautiful towns and scenery, or even if it’s just with a nice pub lunch. 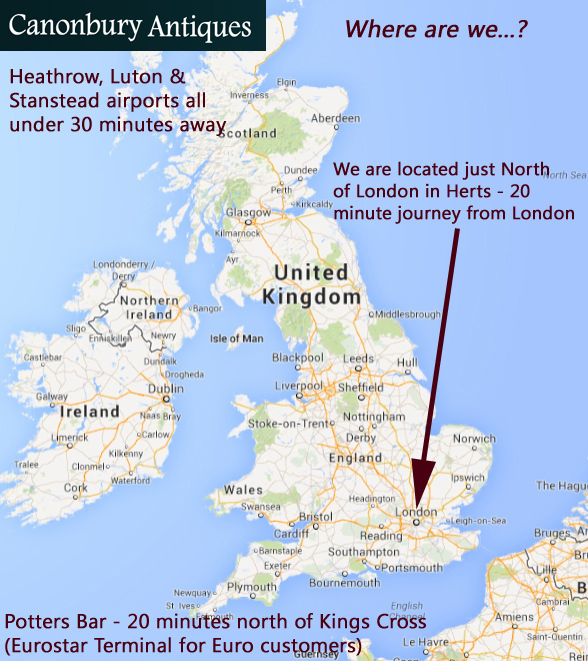 We are only 25 minutes north of London so it’s conveniently located and we hence get visitors from all over the UK (and world). Near to major London airports (Heathrow, Luton, Stanstead) and well connected by rail. We have been in business for over fifty years now (wow, time flies) starting off with various showrooms in London, including in Islington and on the famous Westbourne Grove in Notting Hill Gate, W11. We also had a gallery on Church Street in Marylebone. As the bricks and mortar trade backed off we decided to go 100% online and now sell to a global client base from our website – and this allowed us to move to larger premises in Hertfordshire near where we live which was great for our commuting time and overall quality of live. Of course being outside London allowed us to have more stock and increase our product range so we have a large range of goods in a much bigger space than we ever could have had in our London shops. We hope you enjoy our visit to the Canonbury Antiques Hertfordshire showroom, it will definitely be an experience you won’t forget. The showroom is on two floors and we specialise in art deco furniture, English dining furniture, Continental antiques, French furniture, bronzes, architectural antiques, porcelain, oil paintings and interiors. We are favourites with many London based interior designers. 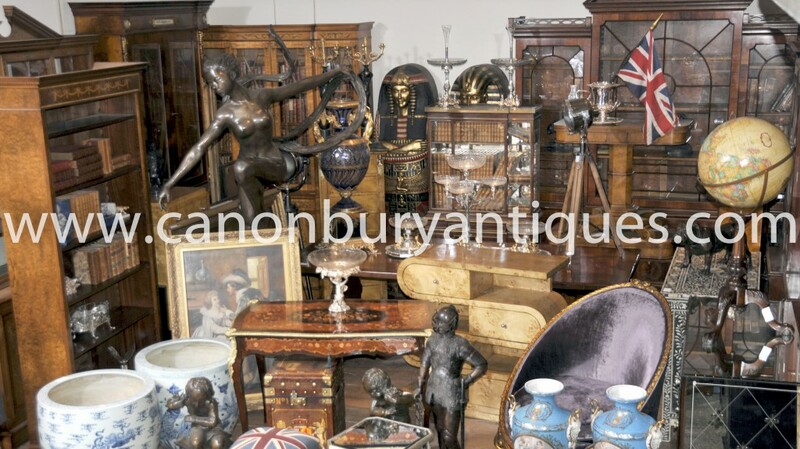 If you would like to visit our Canonbury Antiques Hertfordshire showroom please get in touch.